I leave and breathe dependency chains. It’s how I get stuff done. People work dependency chains all the time without even realising. For the uninitiated, a dependency chain is the list of tasks that need do be done as pre-requisites to fulfil a goal. These tasks tend to be serial and an example could be, to watch the TV, which requires the remote control, which has run out of batteries and needs new ones, which needs a trip to the shops as there are no spares, which needs the car to be refilled because it is low on fuel. I consciously work through dependency chains and mine can be somewhat convoluted. It’s not unusual for me to be polishing the kitchen worktop and topping up the spare toilet roll just to make some toast. The link is there through a tortuous chain of dependencies, knocking down each pre-requisite task like a set of dominos until the end goal is reached. The current dependency chain I’m working on in the garden is a compost heap, which I want to make at the back of the garden as a place to have a single, final discard pile instead of the several we have around the garden at the moment. Working backwards, this is how the dependency chain sort-of goes. There are chain off chains. 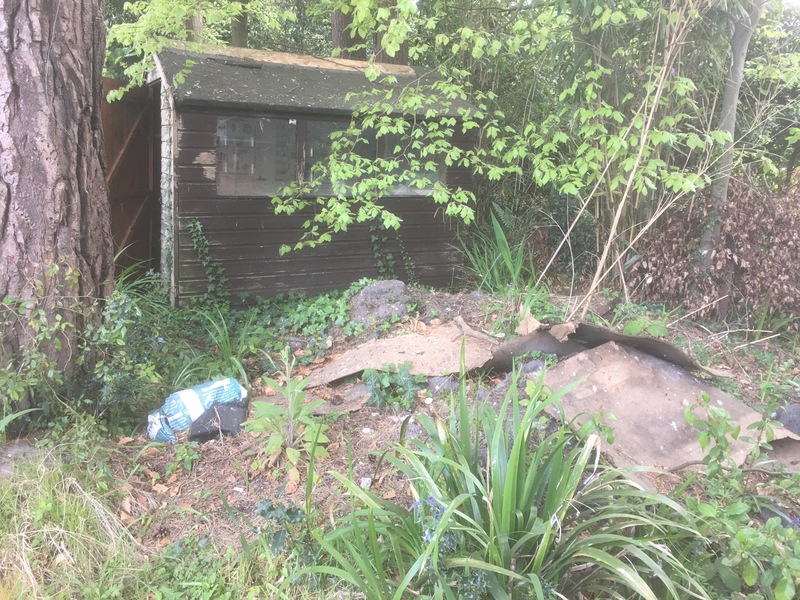 In order to have a clear area around the old shed in order to take it down, I also need to cut the lower branches of the beech trees at the back, these will need disposing of along with the rubbish cleared around the old shed. The inside of the shed also needs to be emptied and rubbish disposed of, which needs a trip to the tip which needs a couple of new tyres on the car as we have a slow puncture, which needs an appointment with the garage, which needs the credit topped up on the mobile phone, which needs pay day. It’s the classic case of one job requiring five before it in order to get done. In the end, all I want is a pile to put grass clippings and prunings, but it’s taken many weeks of clearing rubbish, moving soil, burning waste and levelling just to have an area to work with. At least all this hard work should be just a one-time event only. I’m desperate to have my compost heap as it’s the one place where I can put garden rubbish that’s not temporary and so won’t have to be moved somewhere else at a later date. After three years of clearing discard piles only to have more spring up elsewhere, it would be a novelty so this is one very long dependency chain that I am glad to be gradually working through. Dear Sunil, I lurk here but rarely post. You are clearly a serious and dedicated gardener so this advice is kindly meant, to free you from another future dependency chain- you need 3 compost heaps, adjacent to each other. One that you are filling, one that is “cooking” , and a third one that you are using on the garden. You will thank me in the end. Hello Ann, I had wondered about having separate heaps/piles but thought this was too much, based on your advice though (advice is always welcome) I may just roughly subdivide the existing large pile into three. I don’t really want to get into the whole turning over, chopping and changing if I can help it, it depends on how much the garden produces when n full swing, especially with the hedge prunings. Sunil – Ann is absolutely correct! which is why I don’t. (Have a compost heap that is). All my garden waste goes to the tip and into a special container. This all gets shredded, cooked and eventually becomes bags of compost which are sold, which I buy. Oh! That is a DP!! I had a negative chain yesterday – I wanted to visit a garden in the “Yellow Book”. This required a drive out to find it. Then when I found it, paid and went in, I found a garden currently bursting with phlox and crocosmia. The owner is a real plantsman. Identified two plants and their originating countries from phone-pics. And had many rarities. Where is the chain you ask? I had to buy plants (it’s a compulsion) and now I have to plant them, which means I have to clear some spaces to put them in. And all this because I just wanted to visit a garden! Hello Mrs Mac, we’d have too much to take to the tip and we’d be forever making trips. We do take large bulk items down there or we gradually decant it into the compost bins or even burn it for ash (rare) but having a heap means I can just take grass clippings, deadheads, end-of-year herbaceous plants and prunings to a heap without having to worry about whether the bin is full or making a trip to the tip. Very interesting. Sounds like a good way of organizing tasks. I have not heard this term before – when I first saw it, I thought you might have done a post on unhealthy personal relationships. Hello Jason, nothing to do with relationships, much more to do with program and project management! A dependency chain, in spite of my advancing years Sunil, I have never heard the term used. Regarding compost heaps, I wont be joining you with this one,– I don’t have room. Hello Alistair, your garden is far too immaculate to be marred by a compost heap, if you did have one, I bet it would be the most picture-perfect compost heap I’d have ever seen! I applaud you for being so organised! I might have the chains, but I am incapable of sticking to one of them, so I end up with all manner of half-finished bits of garden. This is why I agree so wholeheartedly with your approach to the compost area and with the comments about having three bins. You’re doing great work in your garden – and your garden will thank you for creating this compost area. 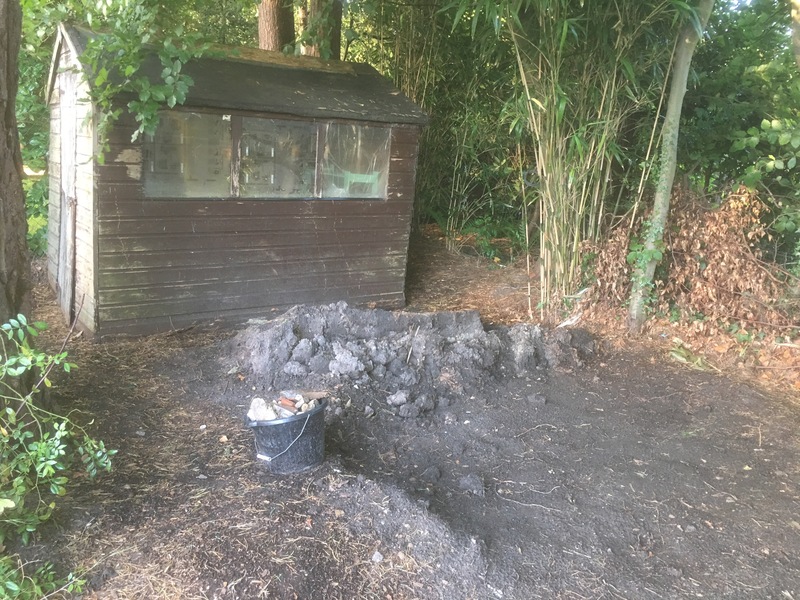 Thank you, Sarah, having one place just to legitimately dump all the garden rubbish was the main reason, the compost it produces is almost a side-effect. It means the way is paved (as it were) to bring the back half of the garden back to a blank canvas. I know nothing about compost heaps so I can’t offer any brilliant ideas! I know you are a dedicated gardener and a very smart man so you will find the right way ahead! Hello Lynn, as long as it remains a pile that I don’t have to move elsewhere at any time in the future I’m not fussed! It’s currently sucking in all the other piles of rubbish about the garden like a vacuum cleaner. Sunil, For many many years I had just a pile and it worked very well. I shoveled out the “gold” from the bottom layer and used it in the beds. I threw the “green” and the “brown” on the top, and removed from the lovely rotted bottom. Now I am working with a group on a pollinator garden and we have a master gardener who is quite committed to the compost pile and it is built and looks quite handsome compared to my former piles. It is in the 3 different piles but let me tell you, it is also a lot more work and shoveling from one pile to the next, with watering and pitch forking/turning required. My feeling is that the finished product is just the same, and imy way works just as Nature works on any forest floor. Hello Jayne, I won’t have a lot of patience for turning over piles and forking over, watering, covering etc. One of the main reasons for having such a large compost heap is to buy time for it to all rot down without having to intensively manage it. I can keep adding things to it and still have room despite not turning over the heap and transferring from one pile to another speeding up the composting process. Some of the piles about the garden were created when we first moved and their bottoms have rotted into compost, so the process does work but it may take a year or two longer and that’s OK.